The 28.1 metre motor yacht Heartbeat of Life, listed for sale by Alex Banning at SuperYachtsMonaco, has been sold in an in-house deal. Launched by Dutch yard Heesen in 1989, she features naval architecture and exterior styling by Mulder Design. Built from an aluminium hull and superstructure, she underwent an extensive refit at Moonen Yachts in 2004 and again in 2008. Upgrades included a 0.9 metre hull extension, a complete repaint and the replacement of all primary machinery. Accommodation is for up to seven guests split across three staterooms, including a master cabin, VIP and twin with Pullman berth. Meanwhile the crew quarters allows for a staff of up to four people. Her Art-Line designed interior décor was created as part of the most recent refit. Rosewood frames and bright orange, red and blue accents combine for a warm and fun ambience on board. On-deck relaxation options include a casual dining area on the flybridge and an Indian-style sunbathing area, which can shaded by the retractable bimini. 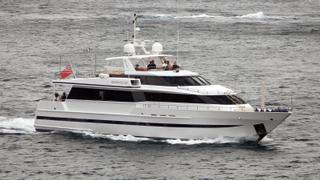 Power comes from a pair of 900hp MTU 8V2000 M90 diesel engines that propel Heartbeat of Life to a top speed of 17 knots. When trimmed back to her cruising speed of 13.5 knots, she boasts a maximum range of 1,200 nautical miles, drawing on a total fuel capacity of 16,500 litres. The captain has expressed a desire to stay on with the yacht, making this a very practical option for a first-time buyer looking for a turnkey cruising experience. Heartbeat of Life was asking €875,000.